Maltose. Sticky, syrupy and it looks like honey. It was an old store. Sacks of rice were piled high on one side. The floor was plain grey cement that had gone dark from years of use. Curiosity brought me to a corner where the shelves held containers and plastic bags of food items that were rarely seen in modern supermarkets. A small layer of dust coated the top. It was here that I stumbled across this little tub of sticky sweetness that was maltose. I had no idea what it was for, but that's why a smartphone is always a handy thing to have around. Meat roasts came up plenty. When husband noticed several 'char siew ' recipes displayed, he promptly insisted that we should get this. I reached out for one. He grabbed a second one and justified the purchase by saying that we may not be passing through this neighbourhood again for some time. For me, this enthusiasm translates to, "Let's have maltose-roasted meat every week! " A couple of days of 'research' later, I narrowed my choices down to this recipe by WokkingMum and adapted it to suit my palate. It turned out really yummy. 1) Mix maltose and hot water together. Stir until maltose syrup is easy to handle. Let it cool. 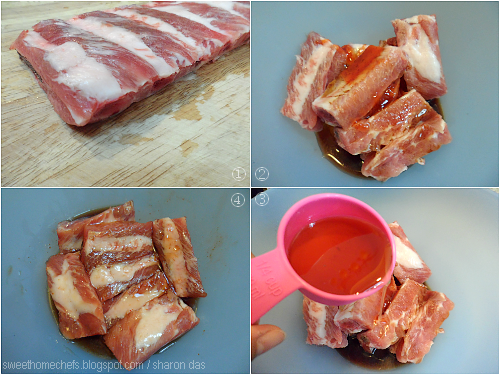 2) Mix pork ribs with cooking wine, chilli sauce, soy sauce and maltose (from 1) together. Cover and leave it to marinate for two hours in the refrigerator (don't freeze it). 2) Take it out from the fridge and stir it up. Line baking tray with foil. Line the pork ribs in a row (meaty part down) and drizzle some of the marinade over. Keep aside a little marinade for later. 3) Bake at 180C in a pre-heated oven for about 1 hour and 10 minutes. At the 30th minute, it begins to sizzle. Flip the pork over on the 40th minute and baste with juices from the tray and brush on the remaining marinade. Bake for another 30 minutes or until nicely browned. 4) Remove from oven. Some gravy would have accumulated in the baking tray. Plate the pork ribs. Drizzle or brush the gravy over. 2) Add soy sauce, chilli sauce and cooking wine. 4) Marinate for 2 hours. 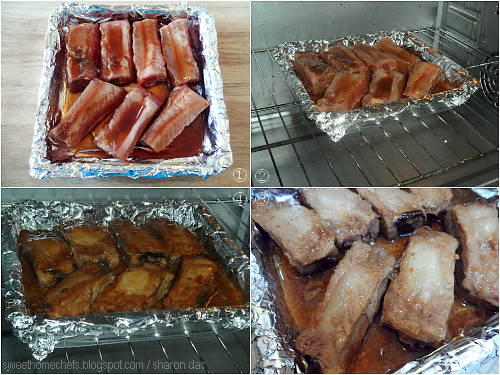 1) Line the pork ribs in a baking tray. Drizzle marinade over. 4) Bake until brown and beautiful. Taste-wise, this is what I would describe as something pleasantly sweet and savoury. It's not spicy even though I added chilli sauce into the mix because I used a mild variety. Best enjoyed with fluffy white rice or on its own. Love maltose as the marinade! These pork ribs must be very tasty. You can say that again. I regretted not making more! Wao....look delicious. I like roast pork ribs too. Next time can try ur recipes. Wow, this certainly looks addictive! 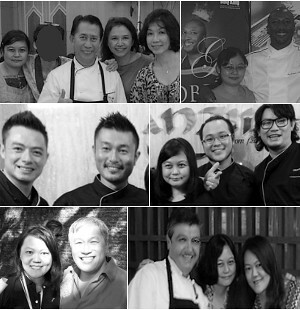 I'm back from my trip & resuming my blog hopping. Have you been cooking up a storm? 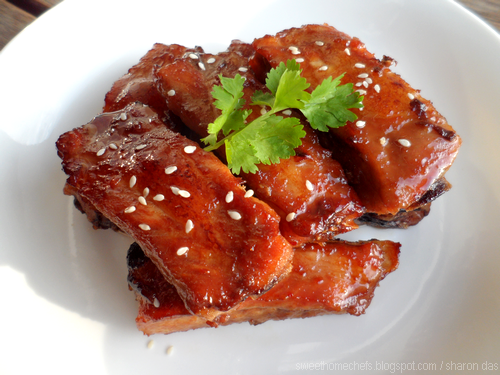 These ribs look delicious, I love the color of it...and the touch of the chile sauce...yum! Sharon, that looks mouthwatering!!!! I want to lick my screen. Wow, these ribs do look tasty. Thanks for sharing... bookmarked! Those ribs look tender and delicious! What kind of flavor does maltose have? Is it sort of like molasses? Sounds interesting! A pleasant, mild kind of sweet. Looks just like honey, but really, really, really sticky! 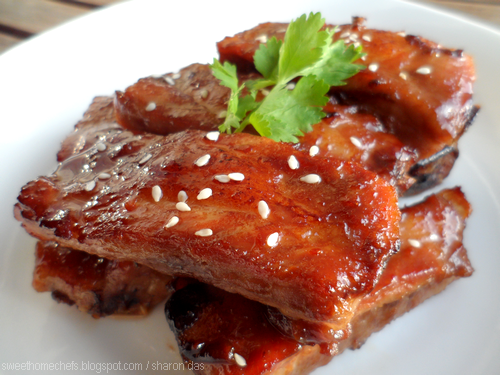 wow, damn delicious and finger licking good sweet maltose pork ribs!! !